I am a Nomadic Mental Health Crusader with 8+ years experience in self, national and international mental health advocacy. 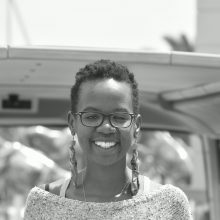 I am best known for running a Google Award winning blog – that provided people in Africa with mental health info & support – for 8 years, setting up Kenya’s first free mental health support line and using my personal experience to bring mental health conversations to the forefront in Africa. My work has been featured in Kenyan and international media outlets – BBC, PRI, Guardian Nigeria & NPR. I have sat in Kenya’s mental health policy review committee and served in the National Epilepsy Coordination Committee. My opinion pieces on matters mental health have been published widely with a piece on the need to include mental health in the Africa Rising narrative syndicated by 4 Kenyan newspapers. I am also a TED Speaker, a MOTH stage speaker (talked at UN General Assembly showcase) and an Aspen New Voices Fellow. Now that I am not juggling the dual diagnosis, I spend my time working with people who’d like to create thriving programs that make an impact in the mental health space in Africa through my academy. I also host a weekly podcast My Mind My Funk – which is a spin off my Google Award winning blog – that aims to make mental health conversations everyday conversations in African homes. I spend my down time tending to my plant collection, trying out vegan recipes or working on mental health awareness merchandise.